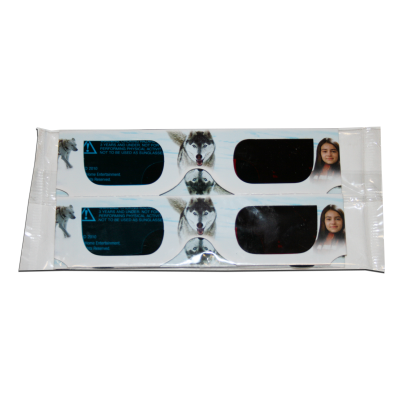 Anaglyph Packaging - American Paper Optics also manufactures glasses packed in 4 packs and 2 packs for easy insertion into DVD, Blu-ray, and video game packaging. As shown here, we produced 300,000 4 packs for the Wi video game Attack of the Movies. 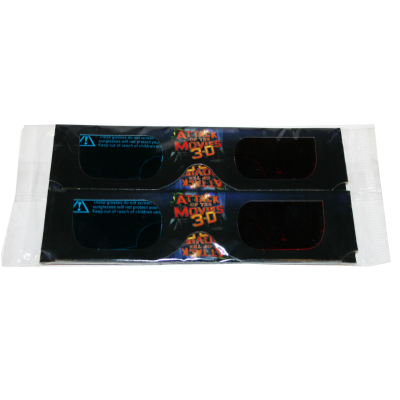 Anaglyph Packaging - We designed 2-up joined anaglyphic glasses for DreamWorks with our special IYF lenses for viewing Shrek 3D on DVD and computers. We manufactured, folded, and poly bagged more than 16,000,000 plain white glasses in 60 days to make the DVD release on time. 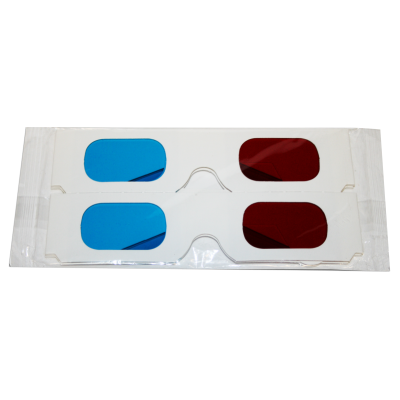 Anaglyph Packaging - American Paper Optics also manufactures glasses packed in 4 packs and 2 packs for easy insertion into DVD, Blu-ray, and video game packaging. We manufactured the 4 packs for the European distribution for the 3D film Call of the Wild 3D.